This would make an interesting topic on its own. The issue of the relative weights of medieval European swords vs. Katana is often filled with inaccurate assumptions, myths, and other wrong generalizations. This reminds me of a similar dicussion of the so-called "lightweight" rapiers vs. the so-called "heavy" single-handed cruciforn swords, etc. etc. Alright, Nathan, you must have known I couldn't resist this topic thread! Here you go, some historic swords' weights and blade lengths! More will be forthcoming. I have to dig around in my library and see what I can find. I listed mostly medieval European swords, but let's include everything we can find! I have more sword weights and lengths. I include blade lengths because a sword's weight is somewhat related to it's length. If anyone requests it, I can give a few more of the details Oakeshott lists for each sword, but I didn't want to make this list too unbearably long to read or type! More numbers yet to come! Does anyone have the same information regarding katanas? Any additions to the thread will be greatly appreciated! Here I go yet again! I've found more about sword weights, this time from Sword in Hand by Ewart Oakeshott. First, Oakeshott stated that, in general, a normal sized medieval sword would weigh between 2.5 and 3.5 lb. Larger swords-of-war rarely weighed more than 4.5 lbs. weight: just under 5 lbs! I can probably find more, but I think this is enough for today! I'm not sure if I can find any katana weights. Can anyone else help with that? Okay, I decided to enter two more to my list before I call it quits for the day. And, boy, these are big ones! I'll see what else I can come up with later, but I think this is quite enough for now! those last two listed seem insane - 14lbs?! even 7 pounds seems a very large weight to wield smoothly, those guys must've eaten lots of beans or something! Note that the 14 pounder is listed as likely a bearing sword. These were for processional and ceremonial use and not for combat. Here are some tables of samplings that has been around for several years. While not all inclusive, it does show the very broad range one might find in weights of various European genre. I know of no similar extant chart for katana, or Asian swords as a grouping. If looking just at katana, there is still certainly a range of weights one might expect to encounter but mostly correlating to overall length. Katana are typically thicker over their whole length, compared to European sabre blades of the same general (ballpark) profiles. Add the longer tiller (grip/tsuka) of a katana or tachi and you are back to the dynamics of how the swords were used. Tachi were the earlier and longer cavalry swords and were typically narrower and a little slimmer towards the point. Still, in either class, much more than three pounds would be a heavy item of these types. Approaching four pounds for either a katana of tachi would be unusual. I think we may obsess a bit much about about numbers. There may be some, more or less, universal truths about dynamics but part of how a sword fits an individual is bound to be a bit subjective. 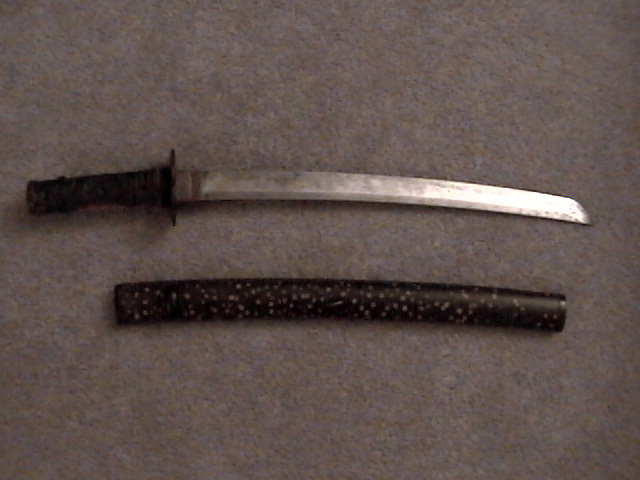 I have a late 18th century wakizashi that is weighs 1 lb. 1.5 ounces and is 21.25" overall. In the album, I have a hilt photo of my English hanger c.1720-1740 that weights 1 lb. 4 ounces. First, thanks to everyone that has contributed information to this thread! Thanks for clarifying that for Adam. I was going to get to it, but got wrapped up in another thread. Yes, I suspect any sword of that size is a processional or parade sword. These swords were never intended for the battlefield; they were purely ceremonial, carried before the great lords as signs of prestige and power. I guess they thought "bigger is better"! I know that weights don't tell the whole story; POB and COP, total length, and other factors are just as important in the handling of a sword. However, the topic of medieval sword and katana weights came up on another thread recently. I thought it would be neat to have a "one-stop" resource with that information. I just thought I could contribute something to this topic utilizing my library. The ultimate goal is to compare the weights of medieval European swords and Japanese katanas, but it might be hard to find enough information to do a proper comparison. I'll have more numbers later! I have to dig through my books and see what I can come up with! No no no no! They aren't for prestige and power! They are for impressing the local ladies! They've never been to war, so when you lead the parade with a huge sword, they think you are strong enough to actually use it.... and flock around you. Yep, that's it. Here are more sword weights and blade lengths, this time from the "Checklist of the Severance Collection" in Arms and Armor: the Cleveland Museum of Art by Stephen N. Fliegel. Note that at least one sword may be lacking a grip, in which case the actual weight during its working life would have been slightly higher. Also note that all weights may be a bit less due to corrosion, depending on how well any sword is preserved. Finally, I didn't add everything from the list; I left off the smallswords, hunting swords, some rapiers, and a few two-handers. Still, I think this gives a good representative mix. Hope someone finds these figures of interest! I think I've found most weights I'm going to in my library! The book Europaische Hieb Und Stich Waffen is a fantastic resource, and seems to include weights for all 568 swords, daggers, rapiers, polearms, sabers, that it pictures (plus length measurements and descriptions). This is one of the best pictorial references out there, too. Also keep in mind, that swords are usually lighter today than when they were new. Superb idea for a thread... why on earth did I fail to notice it before now?? "Europaische Hieb- und Stichwaffen" is indeed an excellent resource, and sadly the relative weights of swords are overlooked much too often in most publications. Whenever I write an article on medieval swords, I always include all the usual dimensions, plus weight, point of balance and the location of the 'centre of percussion' if I have been able to see and handle the piece in question. I believe that when this kind of information is published, it gives the reader a much better idea of the 'feel' of a particular sword, and this is extremely useful if the piece is in a private collection that very few people have access to. It also helps to dispel some of the more ridiculous myths that are so often trotted out by people who have never been near a real medieval sword. Most museums keep a reasonably good record of the weights of the objects in their care, so it would be relatively easy for a prospective author to acquire this information from them, and most curators (in my experience) are only too happy to help. While numbers are interesting, they are not really absolute. Example: everyone who handles them believes that my Sheness katana, a very nice sword, weighs more than my Albion Mercenary. The Merc is actually like 200 gr. or so heavier. True enough! To give an example of two very different pieces, I recently was able to handle a 10th century sword and an early 15th century sword (a Type XV) in a private collection. The point of balance of the earlier sword was way down the blade (over 21cm from the hilt), making it seem very blade-heavy. It's 'perceived weight' was therefore (and not surprisingly) much greater than the Type XV, whose point of balance was only 7cm from the hilt . However, because it had a much thicker blade, the Type XV was actually heavier by 209g, yet it handled like a natural extension of your arm. It was also about 10cm shorter than the other sword. The point of balance, though, is almost exclusively neglected in publications. This is why I like to give as many dimensions, measurements and weights as possible, in order to convey these differences. I also include drawings showing blade cross sections whenever possible, and although these take time to produce accurately, I believe they add much to our understanding of the blade geometry of a sword. Now they might seem mind-numbingly tedious to some, but taken as a whole these measurements and drawings at least give the reader an idea of how a given sword should behave when held. Other factors such as pommel thickness and the span of the crossguard will also have a significant bearing on the handling qualities (and the balance point) of a particular sword, and are just as important as the blade dimensions and weight. So, yes, you are correct in that the dimensions usually given - i.e. length overall / blade length / weight - do not really convey the 'feel' of a sword. But when we include the other measurements that I mentioned above, we are able to build up quite an accurate picture of how a sword will function. In my experience, on the few occasions when I have been able to study some extensive measurements (and weight) beforehand, there were very few surprises when I picked up the sword in question. My own next step will be to measure the properties of actual antique weapons and not just good reproductions, now that I'm more confident in the process. Back in 2004, I had lent a hand in Anthony Shore's data gathering efforts in regards to the myth of the weights of 2 handed swords. He had compiled some good data, as well as a few photos of the specific swords included in the data. (Germany) end of Sixteenth C.
(Germany ) end of Fifteenth C.
Nice compilation of data there, Matthew. Thanks for adding it here.